Back in January, Carrie Nelson and I were on a road trip and stopped by to see Kimberly at The Fat Quarter Shop. Kimberly decided to start a series of Q& A with Kimberly videos and we were the guinea pigs. We had a great time visiting and answering questions from online viewers. 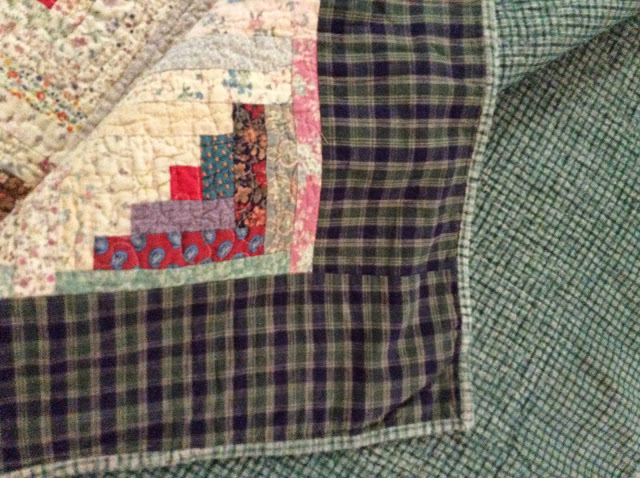 I mentioned the log cabin quilt that I made back in the 80’s. 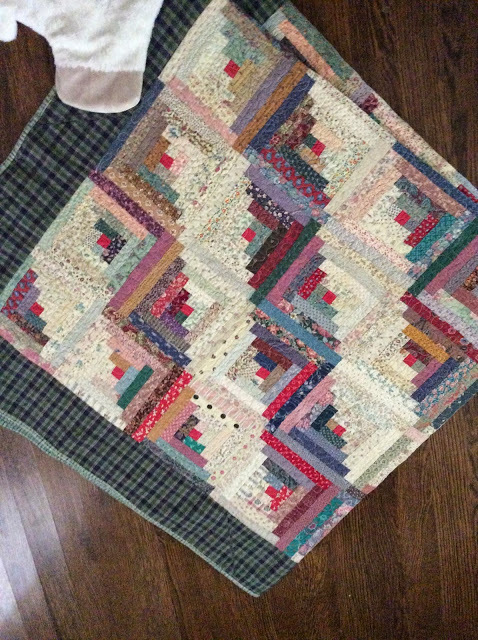 I have had several people ask me to show the quilt so I dug it out of the playpen from my grandson’s house. 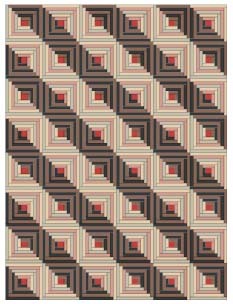 One of the most recognizable American quilt blocks has got to be hands down the log cabin block. One of my quilts is featured in I Love Log Cabins by Martingale Publishing. The setting seems fairly common but for me it is really different. I did not use 5,000,000 different fabrics like I usually do. Each “log” is the same fabric as it is built out from the center, rotating from light to dark and back to light. The blocks are then sashed with assorted putty grey fabrics on only 2 sides, making the blocks easy to assemble. 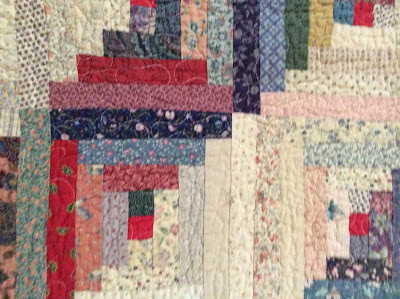 This quilt looks just like it could be a modern version of a quilt on Laura Ingalls Wilder’s bed. Little House on the Prairie fan, anyone? Stock # b1339 Available now at your favorite retailer! How about this classic log cabin with the added stars? Log cabins with red centers represent the hearth (fireplace/warmth) of the home while the light side of the blocks represents the sunny side of the home, dark side represents shady side. to me this version represents a happy cheerful home full of warmth. Isn’t that the fun part of quilting and sharing stories? Each quilt speaks to each of us differently. Wouldn’t this be so yummy in Christmas colors? And if you think quilting is for “old ladies” then you are in for a treat. Just look at this Log cabin variation, Rockin’ the Rainbow by Jackie White. I have not meet Jackie and I have no idea how old she is but she has got to be a ton of fun just by looking at her quilt. It makes me happy, plus I love the funky pieced binding. Young or old, their is a log cabin for you. The log cabin quilt is symbolic for the westward movement following the civil war. There are all kinds of stories about the underground railroad and the use of log cabin quilts to send the enemies locations just by the direction of how the quilts were hung along the fence. Truth or Fiction? Who really knows but as a quilt enthusiast, it does my heart good to believe that quilts have had a social and political statement for hundreds of years. 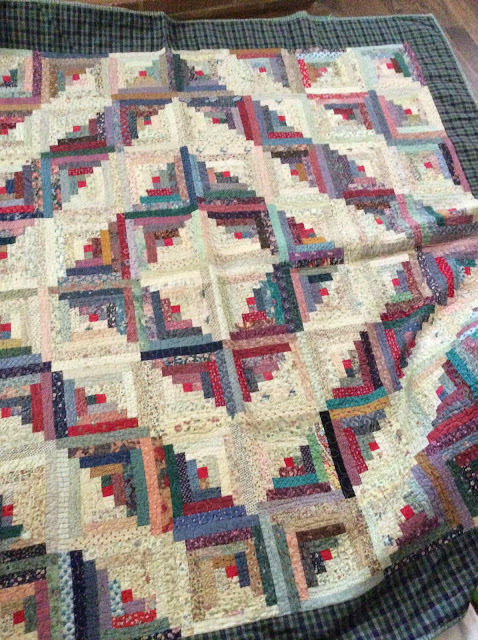 If you would like to learn more about the history of Log Cabin quilts, visit Barbara Brackman’s blog. 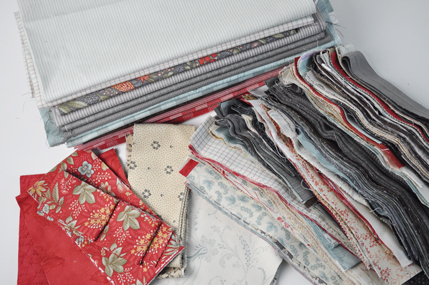 If you are as hooked as I am on Log Cabins and want to make one of these quilts, visit Martingale for all the details. Quilts and More, Spring 2014.
but loved the final outcome. 2 collections from Primitive Gatherings. some of the quilts of today. There is no way to go wrong. see all the other projects inside. Thanks to Maggi Honeyman for her great quilting. Have you ever worked on a quilt project that you just couldn’t sleep? You were so excited to see it all come together that you would sneak off to your sewing machine for hours at a time? I make alot of quilts but I must say that this happens to me a couple of times a year. I even dream about sewing the quilt when I do sleep. I know this may seem extremely odd to some of you, but for those that have caught the fever they will know exactly what I am talking about. 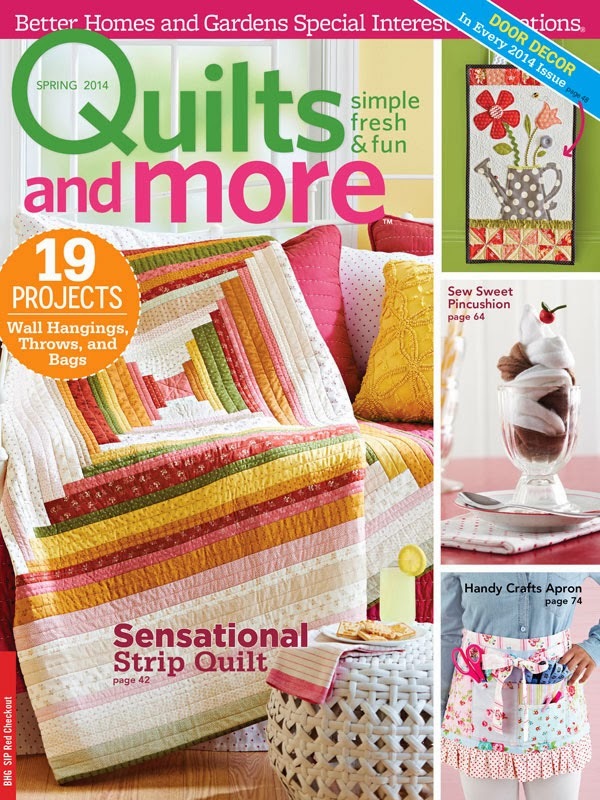 My quilt is featured in the current issue of American Patchwork and Quilting. While I was making this quilt, I thought I should name it When Harry Met Sally. You all know the hiliarious movie starring Meg Ryan and Billy Crystal? If you read my blog often you know that I like to mix different moda designers lines to challenge myself on fabric combinations. I choose two totally opposite groups, Little Gatherings by Primitive Gatherings and paired it with Etchings by 3 sisters. Just like the movie where two total strangers meet, these two fabric lines seem strange to include in the same project. As I sewed the dark browns, blacks, tans, blues and greys on one side and then mixed the soft romantic floral on the other side, I couldn’t help but think of this movie and the power of opposites attracting whether in a chick flick, real life or a patchwork quilt. Throwing in some medium fabrics on both sides for the “Clash Factor” helps make it all interesting. The Log Cabin block is one of my all time favorites. 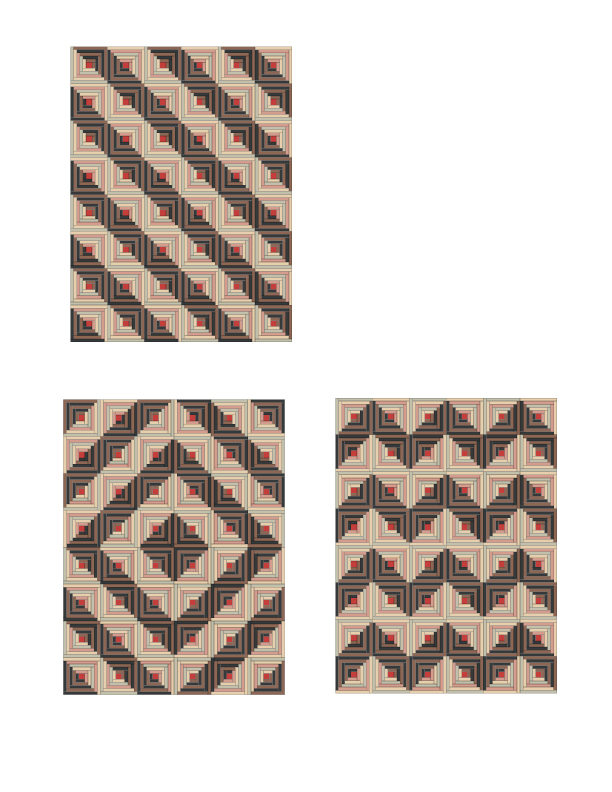 I made larger blocks for a graphic look. The color and layout options are endless. 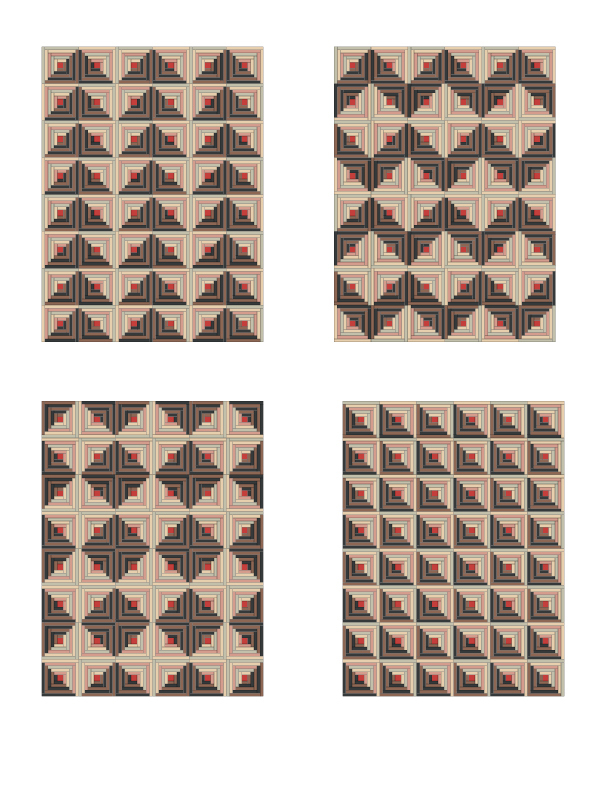 You can find all the instructions on how to make this quilt in American Patchwork & Quilting, but I have taken those same blocks and given you several layout options below. 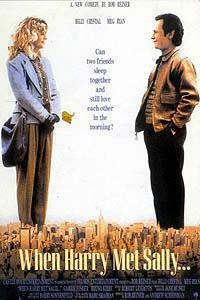 I didn’t name it When Harry met Sally for the magazine but will probably always refer to it as that. So with any quilt I make I have a few scraps left over. It isn’t enough to make the quilt but it will get you started and I am giving it away here along with a copy of the magazine. Leave a comment and tell me your favorite quilt block. I will pick a winner Saturday night the 5th of November. Make sure you have an e-mail address that I can contact you. this isn’t a great picture but I had to introduce Bo’s new puppy, Cassie. A black lab with huge feet just like my boys! Thank you for stopping by. Good Luck and Happy Quilting. COMMETNS FOR THE GIVEAWAY CLOSED. I love the idea of mixing two such different lines. How clever of you to have come up with that. It never would have occurred to me. I love the log cabin. I also love the simple 9 patch.